Peshawar: Pakistan is a developing country with a lot of issues and challenges to look after. The current government is about to complete its 5 years tenure in May 2018. 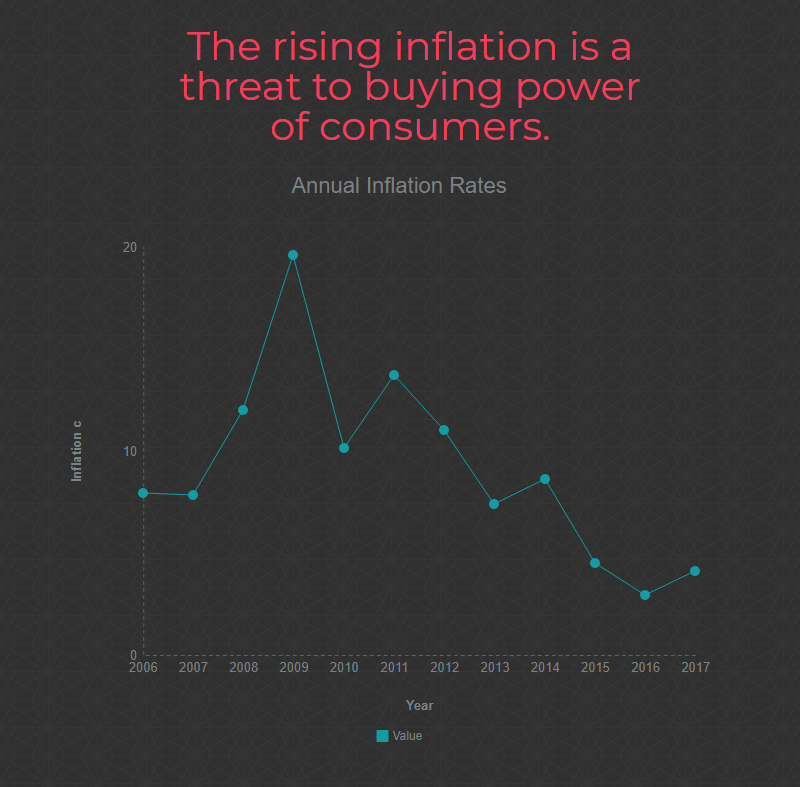 According to experts, inflation and pricing is considered to be a tool for consumer and Inhabitants’ satisfaction for any society. However, inflation and fuel prices have not gained great priority in mandate of current government. And therefore, a control on these went missing in these five years. In 2017, inflation rate in Pakistan was 4.1 %. 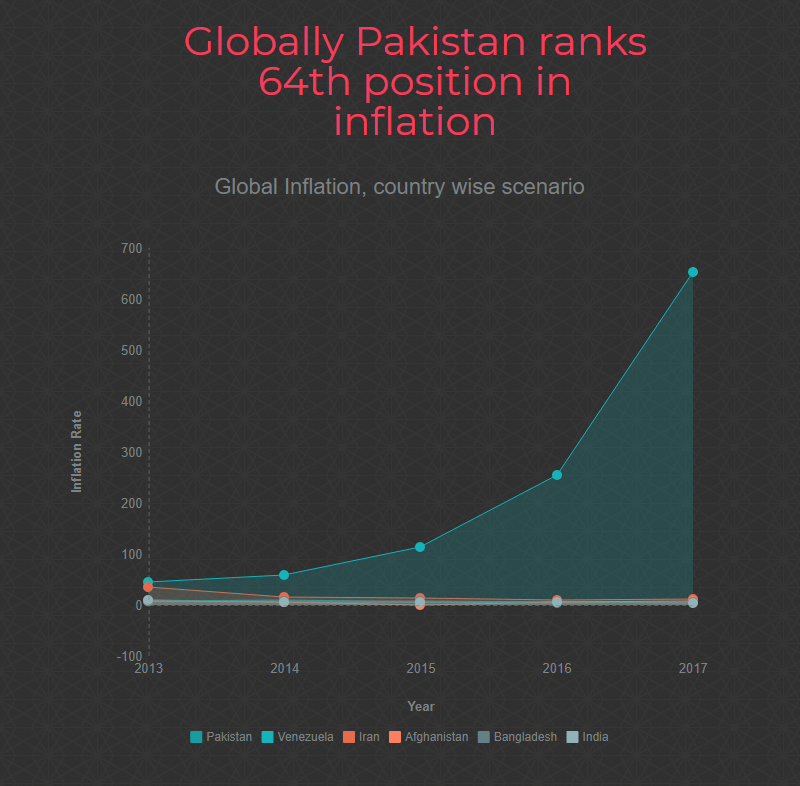 In the international inflation ranking of 2017 between 189 countries, Pakistan stands on 64th, and is close to the positions of countries such as Mauritius and the Indonesia. The highest rate is of Venezuela which stands on top with an inflation rate of 652.7 %. Pakistan core Inflation Rate during 2011 to 2018 is 4.57%. In 2008, Pakistan’s annual inflation rate was 117 that increased to 173 in 2011. A 64% increase is not a minor thing to be ignored. According to statistics issued by Pakistan Bureau of Statistics, Inflation for CPI (consumer price index) , food and non-food items saw an upwards trend. All of the categories other than displayed in table, such as transport, restaurants, goods & services & miscellaneous etc. all had a raise. In terms of price change of daily use commodities, every 3 out of 4 commodities faced an increased price in one year, while remaining 1 out of 4 had no or a minus change. e.g. wheat price saw a 1.4% decrease, onions increased above 100% and several others unchanged. Below table makes it more evident. Wholesale prices also saw a similar increase as prices quoted above. While overall Consumer prices saw an average of 40% increase. In Pakistan, US dollar saw an increase from 95 Rs. to 113 Rs. in last one year and so did the incidents of terrorism. More than a hundred people were killed in terrorist activities in 2017, which means an average of 8-9 persons were killed in such attack every month. Such incidents also trigger the price of commodities. While the prices of dollar saw an increase, an increase in fuel prices and prices for all commodities saw a similar increase. In 2008 dollar was of 62Rs. which at present is hovering a little around 112. The increase in the fuel prices could also be attributed to depreciation of PKR against the dollar. In last five years there was more that 100% increase in fuel prices. The average fuel price rose by 100 percent from 2008 to 2013. One liter of Petrol was being sold at Rs. 40.5 in 2008, jumping off to Rs. 103.7 in 2017 and is now available at Rs.86. While High Speed Diesel witnessed an increase, selling at Rs 38.50 per litre in 2008 against current price of Rs 109.21 per litre. Similarly, other Petroleum prices saw more that 150% increase from 2008-2018. Products such as High Octane Blending Component (HOBC), Compressed Natural Gas (CNG), Kerosene Oil (KO), Light Diesel Oil (LDO) etc. all saw a huge increase in last five years. “Volatility in the exchange rate leads to price hike for oil and gas, which were already increasing in the international market. This badly impacts Pakistan as energy is the largest import item of Pakistan.” said Ghyias Abdullah Paracha, central leader for All Pakistan CNG Association (APCNGA). How does this affect the consumers is very simple. Pakistan imports 75% of petroleum products it requires. The prices in international markets affect the local prices. A resulting increase in prices within country is seen when prices of petroleum products increase on international level. As soon as this happens, the OGRA (Oil & Gas Regulatory Authority) sends a summary to Ministry with suggested price increase which is mostly accepted by Federal Govt. and the new prices come into effect. However, the reverse is not known to Pakistani citizens. OGRA normally does not take action when international market prices go low, the difference in price goes to government treasury. Only in 2016, the fuel prices went low in contrast to intl. scenario after the public stood massively against govt. and OGRA for not providing relief to consumers and filling their pockets. A petition was also filed in High Court. 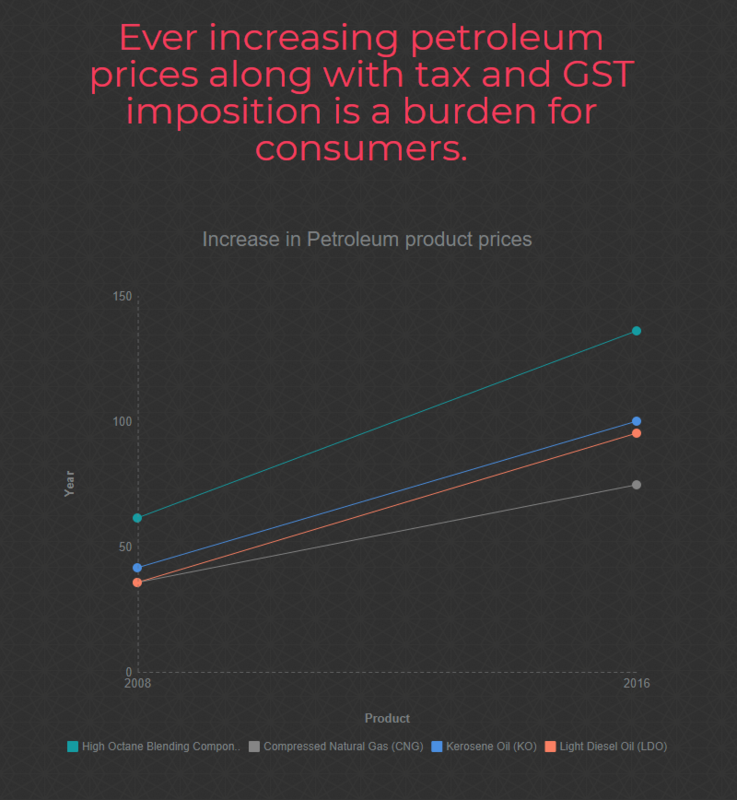 The government’s tax on petroleum and POL products along with imposition of GST is also an added burden to the consumers’ lives. “My salary is the same for years. It is becoming difficult to make both ends meets for me and similar other white-collar families.” said Muhammad Taj who is a private employee in a security company. “Commoner budget and purchasing power is affected with everyday inflation and new taxes. The current increase in petroleum products prices will cause Rs10 to 15 increase in every item rates which will negatively affect the society” said Muhammad Ahmed, an economic expert. “I buy fruit and vegetables from Sabzi Mandi. We add some profit on buying price and sell further to customer. I cannot help when items are costly in mandi.” responded Nawaz Ali (who a shopkeeper in Satellite town is Rawalpindi) on question of why shopkeepers increase prices. “Shopkeepers sell at their own prices. There is no price list and no checking authority. It is us who suffer. The government is about to go therefore are least interested to see our misery” says Asima Bibi, a regular shopper and resident of Khada Market, Islamabad. “It is difficult for Mill owners to absorb the hike in fuel, power tariff and transportation charges. So the burden is passed on to the masses in the shape of price hike for commodities” added Raj Baig, ex-President of Punjab Forum. The analysis shows that this massive oil/gas price hike affects the domestic as well as production in industrial sectors. The result is seen as pushing up prices of transportation, good & services and essential commodities. The bad news is that Pakistan is facing a serious energy shortage issue in the long-term which will further degrade the scenario. In January 2018, petrol prices was increased by six rupees, in turn manufacturing companies such as Toyota and Suzuki announced an increase of thousands per car. The same goes to other sectors as well. Pharmaceutical companies often pretend price hike and charge huge profits from consumers. Down the bottom line, all panic is for the consumer. The final effect is onto pocket of consumer who is sick of the rising inflation and reduced buying power. It is now hard for middle and lower class to maintain their essential needs of food. The govt. should focus on improving the buying power of consumers along with devising strategies to promote local products instead of imports.